The season's biggest blockbuster is complete with an explosive hard rock soundtrack. Marvel Avengers Assemble contains music from and inspired by the film and is spearheaded by the brand new Soundgarden song "Live to Rise". "Live to Rise"--the theme song for The Avengers--is Soundgarden's first new song in 15 years. It boasts a mature sound for the recently reunited band, but it is still very much in the realm of the sound they are most known for. The song fits so well with the plot of The Avengers, but it stands on its own as well. The lyrics are emotional and contemplative, yet the song is hard rocking enough to fit such an action packed movie. "Live to Rise" is the only song on the soundtrack to actually be in the film, but that doesn't stop the rest of the tracks from keeping with its theme. The following track is "I'm Alive", Shinedown's contribution to Marvel Avengers Assemble. The boldness of the guitar riffs and the lyrics--which are about saving someone--are especially fitting for the movie. My only disappointment is that this song was not featured in The Avengers! "I'm Alive" contains all of the intensity and passion one can only expect from Shinedown, and I honestly believe their music would translate very well to film. "Unbroken" by Black Veil Brides full of energy, much like The Avengers, and is filled with classic metal sounding riffs. It has gravelly vocals, a blistering guitar solo, and the chorus is backed by what sounds like an eerie choral arrangement. This catchy track with lyrics like "If we stand together / we will be unbroken" really sums up movie in the simplest of terms. Bush's "Into the Blue" is quite unique and begins to break from the other songs from the soundtrack. The choruses are very much hard rock, but the verses are set to a super laid back guitar and bass groove, making it almost feel like a Cure song. "From Out of Nowhere" by Five Finger Death Punch is arguably the hardest and fastest song on Marvel Avengers Assemble. The intro riffs are especially heavy, evoking an image of Thor swinging his hammer--creating a perfect addition to the soundtrack. The international (outside of North America) release of Marvel Avengers Assemble features a bonus track, "Pistols at Dawn" by Kasabian. Much like the Bush track, it veers from most of the other songs, but even more so. "Pistols at Dawn" has a certain '60s/early '70s sound. The fuzzy, distorted, feedback-laden song is slow and definitely has a "stoner rock" feel. This track is great, yet so different from all the other songs from Marvel Avengers Assemble. Other bands and artists with tracks featured on Avengers Assemble include Rise Against, Papa Roach, Scott Weiland, Redlight King, Evanescence, Pusherjones, Buckcherry, and Cherri Bomb. 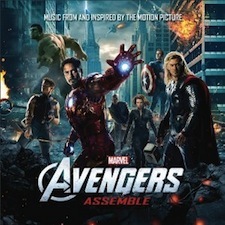 Marvel Avengers Assemble is a fantastic album and complements The Avengers film very well. It is a very cohesive soundtrack. The songs that aren't even in the movie are still consistent with the film's theme and message. Each each song invokes a certain image of the movie, and the lyrical themes about banding together to save the world really help The Avengers stick with you long after leaving the theatre.